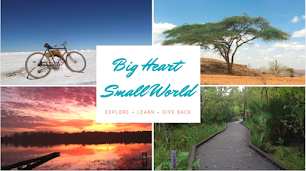 Big Heart, Small World: So Many Monkeys! I arrived In Kakamega forest Easter Sunday. Kakamega rainforest resides in Western Kenya, less than two hours from either Kisumu or Eldoret. It's abundant wildlife and activities makes it a great weekend getaway. Kakamega has many places to stay for any budget. If you are interested in saving money you can stay in the Isecheno Keep bandas between $6-9 depending on your residence status in Kenya. The Isecheno Blue Shoulder Lodge which is approximately $5 for a dorm-style lodging. If you are interested in higher end accommodations Rondo, a Christian retreat offers room and board for $60 a night. On a smaller budget my friend Kris and I decided to stay in the bandas for 700KSH ($7) a night for residents. We also packed food and snacks to minimize costs. When we arrived to kakamega forest ranger station we paid park entrance ($4 for residents) and were given a small tour of the area. Next we were shown where we were going to be sleeping. Our banda was a large thatched roofed house with cement walls. It has a small covered porch for sitting. Inside were two bedrooms, each with two beds and a mosquito net. Inside the thatched roof was lined with spider webs and probably many other bugs. The bed was a small twin sized mattress with a small slope in the middle from overuse. The pillows were thin and the chicken wire over the windows to keep out the monkeys was mended with rope. Despite the place not being very appealing it was a roof over our head, something soft to sleep on and only $7. The banda was in a compound with five other similar bandas, an office, outdoor toilets and a large covered sitting area. The compound was surrounded by large trees and a green lawn. The thatched roof bandas fit perfectly with the surrounding forest. On the compound resided a group of seven German volunteers and a lone German traveler. Once Kris started speaking in German it felt like I was in Germany rather than Kenya. Everyone was very nice from the other group and helped us navigate around the area. A five minute walk down the road, by the green house, across the main road was a small wooden shack called the canteen. This run-down building was where you could order lunch and dinner. Its small menu boasted local favorites such as ugali, matoke, and sukuma wiki. The prices are a bit more than what you find in the cities but still reasonable. Kris and I decided on dinner, matoke, cabbage and beans, and placed our order. Since there are only two cooks and food perpetration take many hours, they recommend you place your orders hours in advance. Our bill ended up being only 200 KSH ($2) for both of us. After ordering dinner around 2pm we set off on our first hike. Limited on money we decided on the short hike for 500KSH ($5) and the sunrise hike for 1200KSH ($12). This is the priciest part of the whole trip, but they are worth it. Ask fro Abraham as a guide, he is fantastic and very knowledgeable. He is a avid birder, so if you like learning about the different bird species he is the one to hire. We walked out into the forest stopping every 5-10 minutes for a story. He explained to us about the medicinal properties of the plants and the history of the forest. His eyes were excellent, he was able to spot birds and animals and name them in seconds. He had a pair of binoculars which he he lent us to see birds and monkeys that were far away. As we walked, monkeys jumped through the branches over our heads. Cricket and bird calls filled the forest with sounds. Soon we arrived to a clearing. He explained to us that these islands of grasslands within the forest were shrinking as the rain forest swallowed them up. We climbed to the top of a watch tower which was missing quite a few steps. A the top we met another group consisting of two American's from Oregon. We sat at the top talking and looking out at the monkeys jumping through the trees. We headed back down and back to our banda. We sat on our porch talking and listening to the sounds of the rainforest. At eight we headed over to the shack for dinner. Despite order only matoke (stewed green bananas) beans, and cabbage we still had food left. We said goodnight to the other group of volunteers and headed to bed early. The next morning we awoke at 5am to head out to the sunrise hike. The sunrise hike is a 4km walk down the road and up a large hill. This hill, due to its volcanic rock composition, was clear of trees. It was the highest hill in the forest and therefore offered an amazing view of the sunrise. We hiked in the dark with our torches and finally reached the top. The two American's from Oregon were sitting at the top. We handed out the five PB&J sandwiches we had made and we ate as we enjoyed the sunrise over the rainforest. After sunrise we headed down the mountain and stopped at a cave. The cave was 50 meters long and was filled with bats and crickets. If you are afraid of bats or creepy crawlies this cave is not for you. After the cave we hiked home. At home we enjoyed another peanut-butter and jelly sandwich under the covered sitting area and took tea with the Germans as we talked. After lunch we went exploring. We found a small trail leading into the forest and began walking. We made markers at each fork to lead us back. The trail began getting narrower and narrower, until we reached a point when we were ducking under trees and jumping over logs. Finally we turned around and headed back to camp. On the way, we were surrounded by monkeys. They were close enough that you could reach out and touch them. We watched them as they played in the trees, running over the thatched roofs, running around our feet. Small babies clinging to their mother's bellies as the monkeys swung from branch to branch. After several minutes of watching we got back into Kris's car to head back to Eldoret. Over all Kakamega was very relaxing. The forest was beautiful and green. The hikes were leisurely and not very strenuous. The forest was warm and humid, but not too hot. The nights were chilly, perfect for a sweater. Overall I would go back and visit. Its a great weekend trip that won't break the bank.